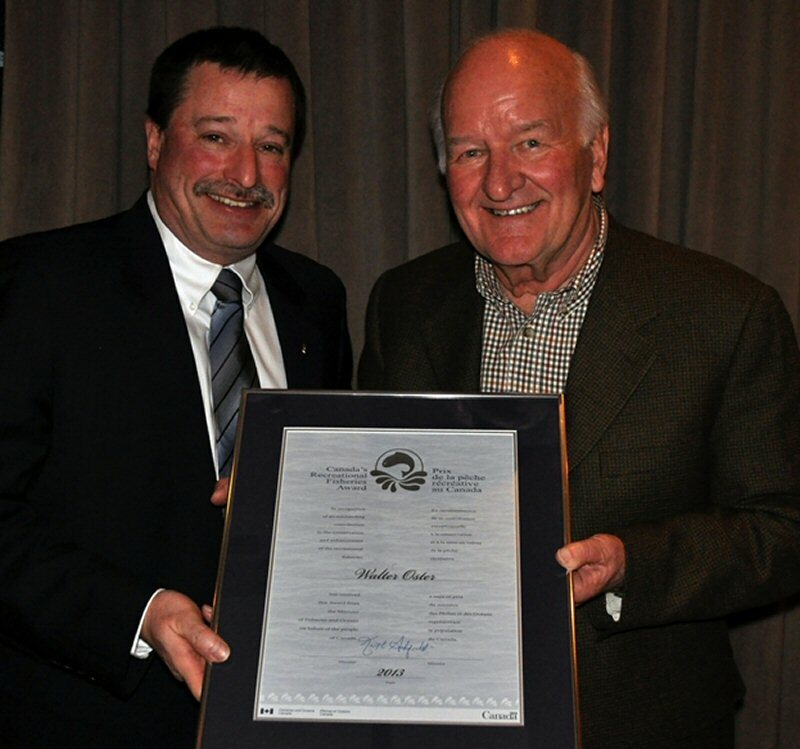 Walter Oster was presented with a 2013 Recreational Fisheries Award on Tuesday, January 21, 2014 by Dave Burden, Regional Director General, Central and Arctic Region, on behalf of the Honourable Gail Shea, Minister of Fisheries and Oceans. For many years, Walter Oster has been a tremendous contributor to, and advocate for, recreational fishing and conservation in the province of Ontario and especially for the development of urban angling opportunities in the Greater Toronto Area. He has a remarkable enthusiasm for fishing, and in particular for getting youth involved in fishing. With a high level of personal commitment and passion, he has given freely of both his time and money to ensure youth have the opportunity to fish, by organizing fishing events, engaging partners, organizing meetings, connecting with politicians, and donating significant amounts of fishing gear. Mr. Oster has made a career of supporting recreational fishing and what drives recreational fishing, and has had influence throughout Canada with his fishing and boating shows. His leadership has led to funding and support for fish enhancement, research, and scholarships for post-secondary students involved in conservation, outdoors and fisheries programs. Walter Oster contributes to recreational fisheries for all the right reasons. He believes passionately in the value of fishing to the development of our youth, understands and values the conservation of our natural resources, and understands the important role that anglers can play as stewards of the resource. He has benefited from the resource and he truly "gives back." In 1997, Mr. Oster re-established the Great Ontario Salmon Derby on Lake Ontario, the world's largest fishing derby, which generates over $110 million in economic benefits to the local economy and attracts approximately 22,000 participants annually. "Our Government is proud to recognize dedicated volunteers for their outstanding commitment to conservation of resources and to recreational fishing. Their efforts to protect fish and fish habitat and to promote recreational angling help preserve our important resources for future generations to enjoy." "Recreational fishing is a tradition worth preserving and protecting for future generations. I offer my sincere congratulations to Walter Oster for his outstanding contribution to recreational fishing in Canada." "I caught my first fish with my Godfather when I was six years old in Grenadier Pond, and have been fishing ever since. It is important that today's youth experience fishing because it introduces them to the outdoors and leads to the appreciation of the environment and conservation. It them brings outdoors and away from their computers and games and, in most cases, encourages interaction both physically and mentally with their parents or parent." - For more information about the National Recreational Fisheries Awards, please visit http://www.dfo-mpo.gc.ca/rfa-ppr/awards-prix_e.htm. Regional Director General Dave Burden presents Walter Oster with a 2013 Recreational Fisheries Award. Mr. Oster was recognized for his tremendous contributions to recreational fishing and conservation in Ontario.